Lynne was born and raised in the creative environment of the theatre town of Stratford, Ontario. She has, like many artists before her, found her artistic expression in the breathtaking beauty of nature. 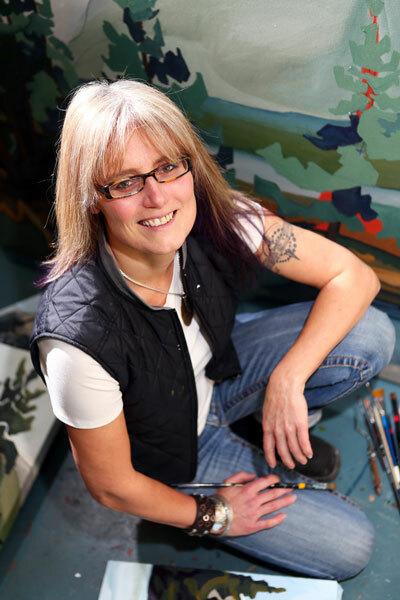 She is a graduate of the Art & Art History program at the University of Toronto/Sheridan College and, on what was to be a short stop in Banff in 1992, Lynne found endless fuel for her artistic passions in the trees, rocks and water of the Rocky Mountains. She enjoys spending hours walking, sitting and sketching outdoors, absorbing the sensations of a natural experience and then taking those sketches and feelings home to translate them onto canvas. Her hope is to convey to the viewer the peace and awe she finds in, and the respect she has for, our magical home, this planet. Since the early 1990′s my work has been focused on the majesty and power of nature, and often the solitude. I am ever fascinated by the lines created by trees, rocks and water. The focus for my work developed out of my photography, which centered on tree roots, rock formations, or water swirling along the shoreline. I find these lines of nature fascinating, but at that time wanted to find a way to get closer to them. Now I paint them. I spend hours walking, sitting and sketching, trying to tap into the austere stillness, sereneness, nature offers. I spend hours walking, sitting and sketching, trying to tap into the austere stillness, sereneness, nature offers. Through my interpretations I aim to convey to the viewer something peaceful, perhaps a little sublime, maybe at times a little sensual, and even sometimes a little whimsical. The images are almost always drenched in rich greens and blues, with earthy browns – a little dark in some corners, a little bright in others, reflecting the changing face that nature has. I often work on many images at the same time. There is most certainly a playing off of one image to another as I work, sometimes the problem in one painting creating the final resolution of another. Music also has a great influence on my creativity, the performer’s translation of mood and spirit plays with my own mood and spirit. I have been involved with many projects that incorporate music … childrens shows, CD artwork … and plans for many projects to come. Because of my strong emotional attachment to music, there is rhythm and lyric in all that I paint. I will continue searching for interesting rocks, rivers & trees in my neighbourhood, there is much in the Canadian Rockies and the Canadian West Coast to keep me occupied for years, though I hope to search for trees in many other locations of the world.